Following a major restoration and renovation, this Cape Cod home — on the National Register of Historic Places — is offered. The restored antique sections of the home (1804) with numerous historical features including wide planked wood floors, four (non-working) fireplaces, other classical architectural details, and antiques. The historic first floor features the traditional Cape Cod keeping room (aka living room), a study with 1/2 bath, and the master bedroom, with queen sized brass bed, and its attached bath with clawfoot tub/shower. Upstairs are two bedrooms, one with a full-sized bed, the other with a pair of twin beds. They share a full bathroom with shower. 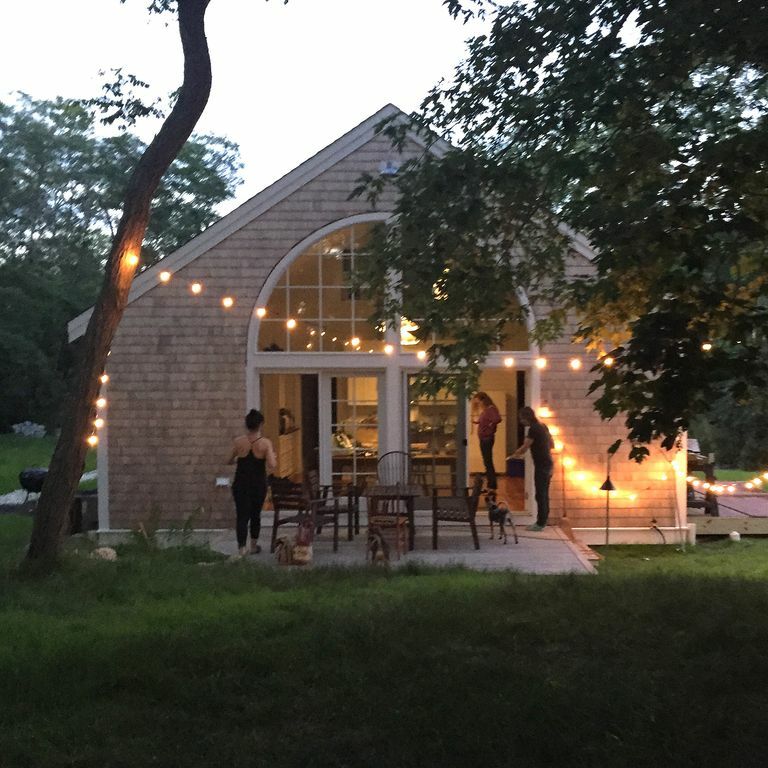 The fully renovated addition is now a cathedral ceilinged kitchen and dining area with a double-height Palladian window leading out to a large deck and a spectacular view of Cape Cod Bay through the trees. The spacious new kitchen is a cook’s delight with Quartz counters, an island sink, dishwasher, microwave and DCS gas range. The dining table is made from teak recycled from the decks of the World War II USS North Carolina. A private path down from the house to Blackfish Creek’s sandy edge and the Bay beyond. This is a prime launching spot for kayaks and other small craft or quiet walks along the shoreline. The Fox Island Marsh and Pilgrim Spring Woodlands Conservation Area and Trails are only a few houses down the beach. The home has full central air conditioning, a washer/dryer, dishwasher, wifi internet and all new plumbing. Minimum age limit for renters, children welcome, non-smoking only, pets considered	. Note that the historic cape cod stairs to second floor are steep by modern standards and the home is not wheelchair compatible. Semi-retired and living in New York City, we inherited this home four years ago. The house has been in our family for forty years. The house is rich in history and architectural detail. It is a beautiful example of a full Cape Cod Cape home design. Our goal in its recent restoration has been to retain as much of the home's historic fabric and patina, while incorporating much needed 21st century technological improvements. The house is at the end of a quiet road. A coastal buffer zone means that all the neighboring homes are set back from the water resulting in a naturalistic, secluded beach walk. 4 fireplaces are not functional. I've been renting houses at the Cape for about 2 decades. I've found houses that had terrific locations a few blocks from the Ocean or houses that were lovely. Stop the presses. The pleasant point property is a perfect location (on the water and a terrific path for walking and watching the Cape change through the tidal cycle) and a perfect house. The house has the charm of a 1804 building that has been tastfully restored plus a modern kitchen that has been added on with astute touches (e.g. the wide boards in the old section is carried forward into the new section; the addition has a cathedral ceiling so you can fully appreciate the Ocean). The owners are gracious, accommodating, and attentive. We had two couples, one mom, and her adult son stay here. There was enough room for everyone to be together and go away for a private moment. Laundry on site was an added bonus. Close to beaches, I hope to return again. We are happy you enjoyed your stay. Thank you for taking such good care of our house. The setting is beautiful. Nice waterfront views. If you have room in your car, you might want to bring some extra outside folding chairs for additional outdoor seating (there is only one fairly small table). The kitchen is beautiful and fun for cooking in and gathering. The setting is exquisite.